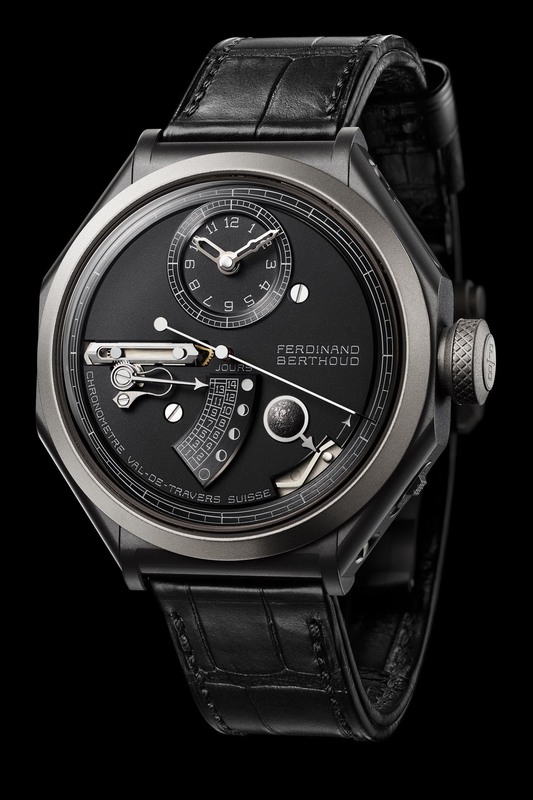 Ferdinand Berthoud adds the age and the phase of the moon to its Chronomètre FB 1. 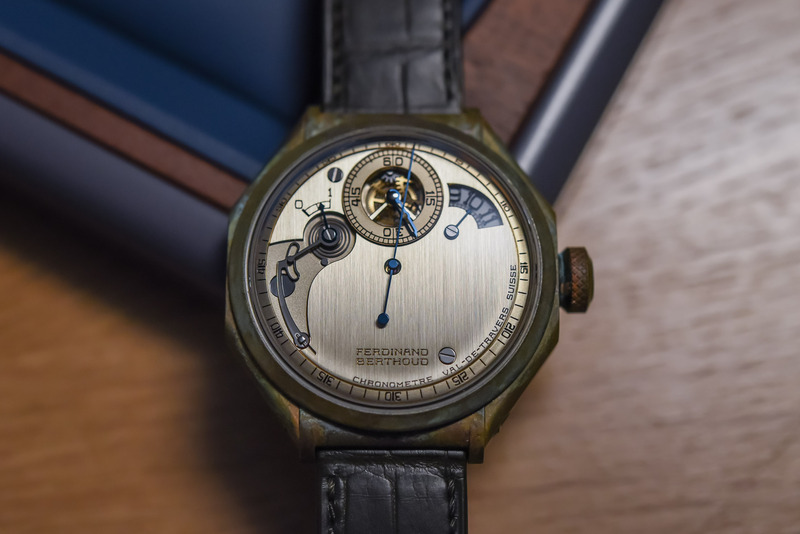 After the inaugural tourbillon model (deployed in various editions here, here or here) and the recent addition of a complex regulator version, Ferdinand Berthoud continues with the evolution of its superb Chronomètre watch. Still powered by an in-house, hand-decorated tourbillon movement, still featuring the desirable and rare fusée-and-chain constant force device, the brand adds a moon display on the Chronomètre FB 1L, unveiled at Baselworld 2019. Yet, don’t expect it to be just a small window with a moon phase. Things had to be more complex than that. The basics are still present in this new Ferdinand Berthoud Chronomètre FB 1L (the “L” is for Lune, the French word for Moon). The case relies on the signature octagonal shape with modular construction. Despite its large diameter on paper (it is indeed 44mm across), the watch is much more compact than you’d imagine. Dial-wise, the typical indications with large central seconds and off-centred hours and minutes are where they used to be and the overall dial retains is unique style, with the indications that are affixed on the main plate and not printed on a dial. The look is both antique and modern at the same time. 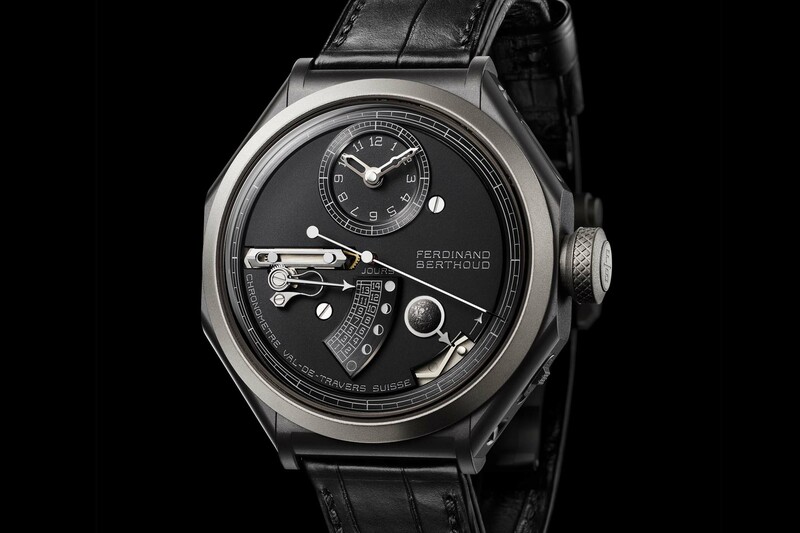 The Moon version of the Ferdinand Berthoud Chronomètre watch will be available in two different versions. First is a rather classical 18k white gold model – a material used for the central container, the bezel, and the lateral elements. The inter-lug inserts are made of black ceramic. Matching this bright and technical look is a frosted brass dial that is rhodium-plated and combined with blued hands. This reference FB 1L.1 will be limited to 10 pieces. 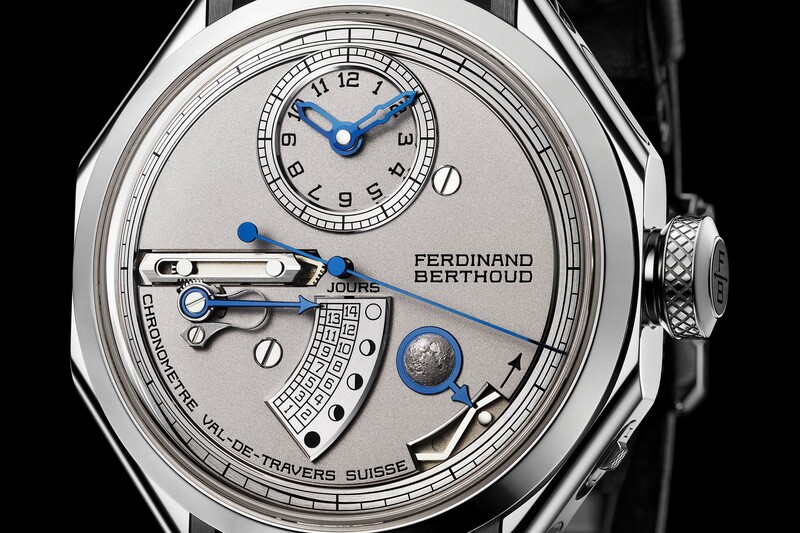 The second version, the Ferdinand Berthoud Chronomètre FB 1L.4, is a more contemporary take on this watch. The case mixes a central container and bezel in sandblasted 18k gold, to which lateral elements and inter-lug inserts in black ceramized titanium are attached. The dial follows the same scheme, with a black PVD-coated frosted brass base and indications and hands that are rhodium plated – a cold and contrasting colour scheme. This reference FB 1L.4 will also be limited to 10 pieces. Display-wise, we can see several novelties. 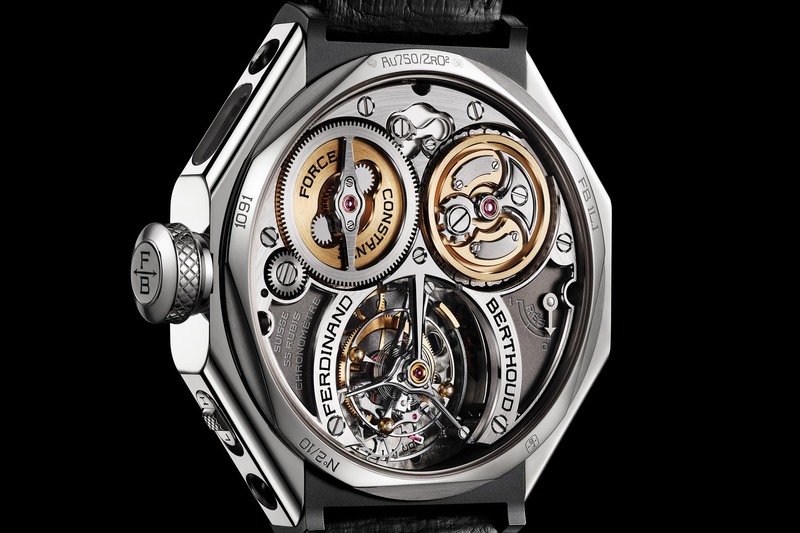 First, the tourbillon isn’t visible anymore through the dial. Yet, the main timing indications (hours, minutes, seconds) are still located where they used to be in past models. What is new is the addition of not one but two complications related to the Moon. And, of course, those aren’t simple Moon indications. As one of the greatest watchmakers of his times, Berthoud was part of the French Royal Academy of Sciences and Horologist-Mechanic by appointment to the King and the Navy. This means that some of his research was focused on calculations of longitudes and latitudes – calculations are done at that time thanks to marine clocks. 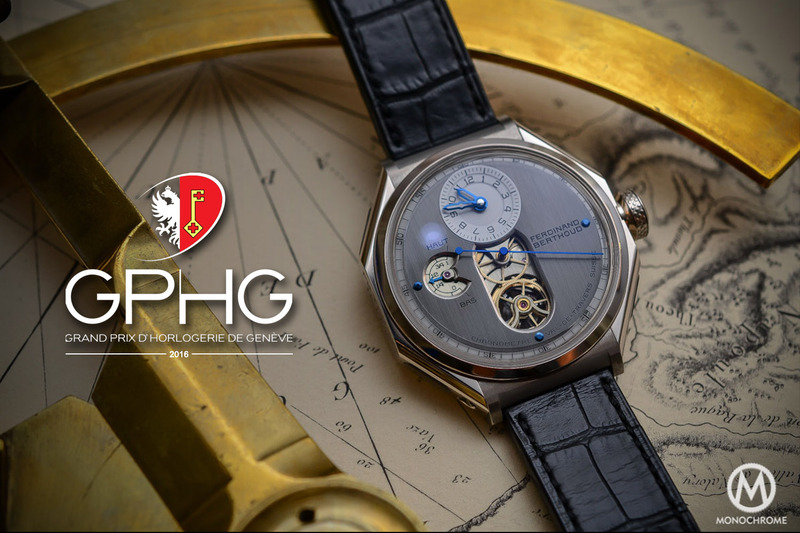 Together with engineer Jean-Charles de Borda, Berthoud created several devices based on the Moon to calculate longitudes. In 1752 is invented the “Cercle de Borda” or repeating circle (itself based on the initial idea of Tobias Mayer, the reflecting circle). The Cercle de Borda measures angular distances by repeating several times the same observation on a circle without returning to zero. Its peculiarity: the more measurements are performed, the more its margin of error is reduced. The circle of Borda is the indispensable hyphen which allowed to pass from the octant (with a precision of 150 nautical miles, or more than 270 km) to the sextant (precise with 0,2 miles, or 370 meters). This invention could determine the position of the Moon with great precision and, de facto, the longitude. 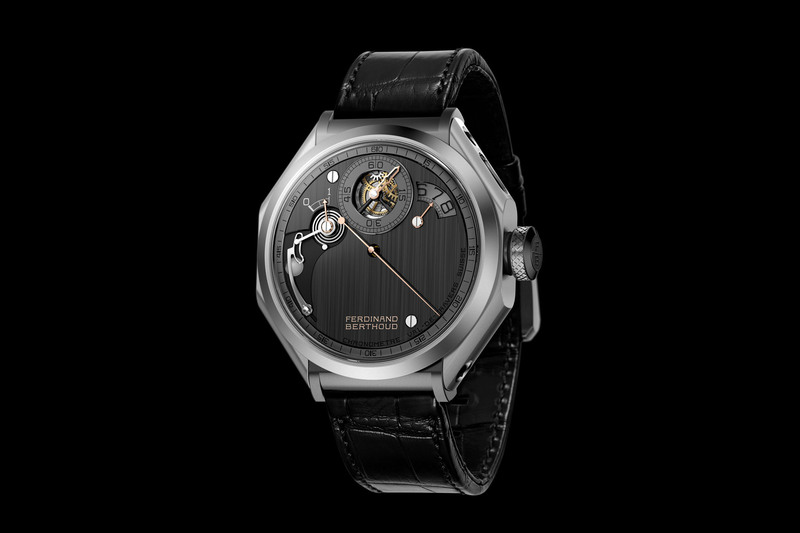 The Ferdinand Berthoud Chronomètre FB 1L is a tribute to this invention. 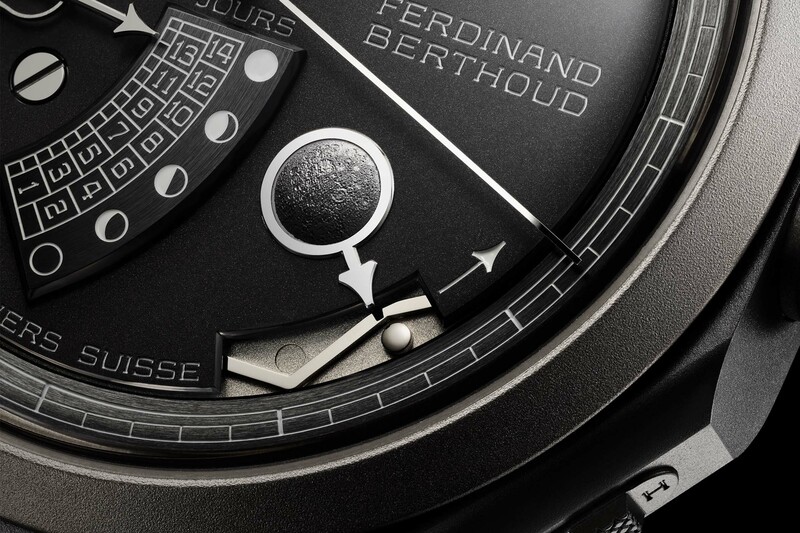 This new Ferdinand Berthoud features two indications related to the Moon: one for the age, one for the phase. It thus combines chronometric precision and astronomical measurement. Few might know but the age and the phase of the Moon are two distinct measurements. The Moon phase is the most common in watchmaking. This complication visually indicates the different lunar cycles. The Moon phase is divided into four steps: new Moon, first quarter, full Moon and last quarter. The Moon phase is indicated on the dial, between 4 and 5 o’clock. It displays what is the phase of the Moon – increasing or decreasing – by pointing a semi-circular window in which a disc is running. The age of the Moon is a more precise indicator. It counts down the number of days since the last new Moon. This is this indication that allowed calculations of longitudes almost 3 centuries ago. This indication is technically complex, as a linear segment transmits a precise angle to a hand that indicates the age of the Moon on an arched track, graduated from 1 to 14. This indication is bi-directional, meaning that once it reaches the 14 position, it will slowly go back to its original place – thus indicating a rising or descending Moon. The base of the movement, however, remains the same. 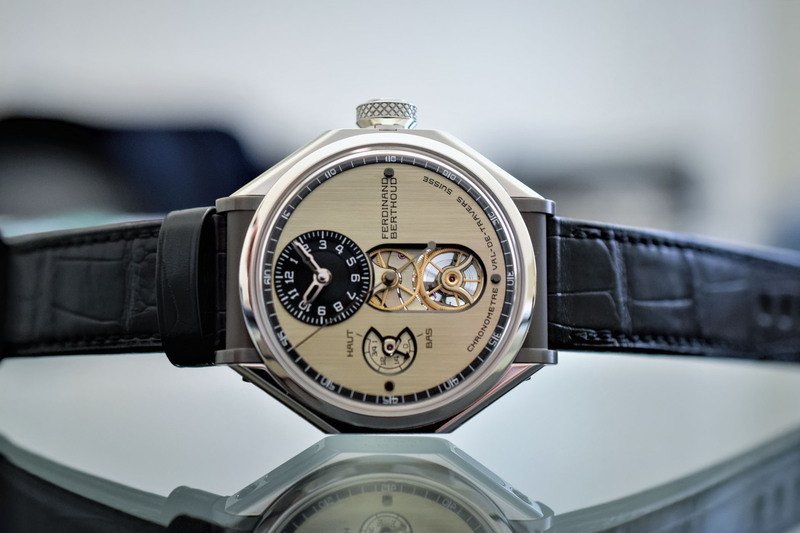 The Ferdinand Berthoud Chronomètre FB 1L features the ultra-complex and ultra-detailed calibre FB-T.FC, with its inverted one-minute tourbillon with direct seconds display and its fusee-and-chain winding device. The movement comprises no fewer than 1,270 parts (including 790 for the chain and 67 for the tourbillon), all impressively decorated. 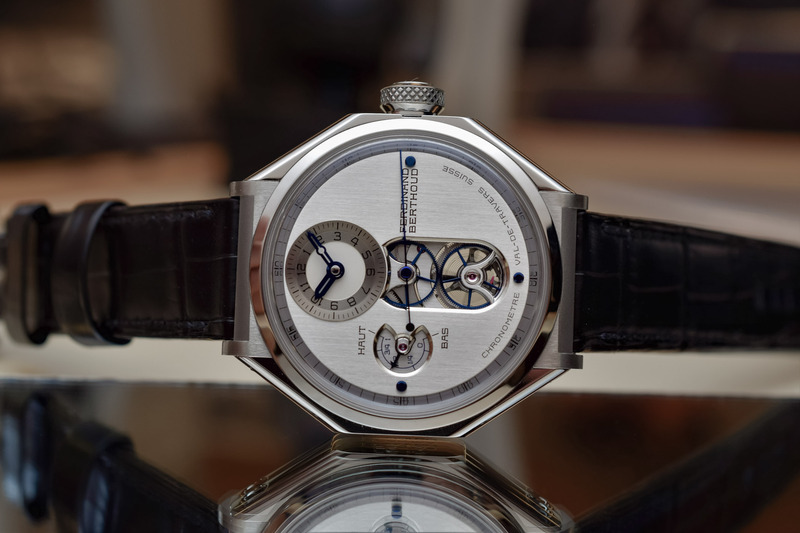 The movement is here presented in black-rhodium German silver. 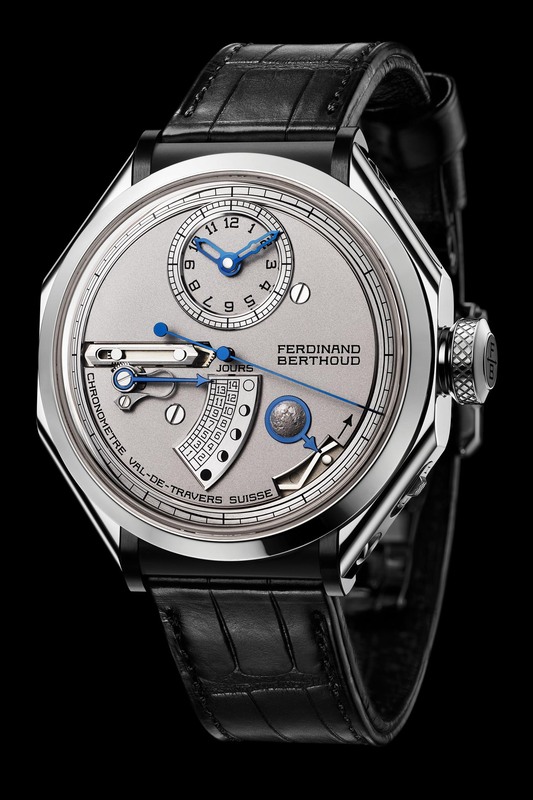 The price of the new Ferdinand Berthoud Chronomètre FB 1L will be CHF 250,000 for the FB 1L.4 (titanium) and CHF 265,000 for the FB 1L.1 (white gold). More details at www.ferdinandberthoud.ch.